This blue Caribbean Wave creamer and sugar bowl are in excellent condition. They were made by The Duncan Miller Glass Co. in the 1930's. 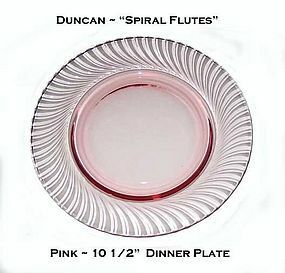 This pink Spiral Flutes 10 1/2” dinner plate is in excellent condition. These are fresh from an estate here in NW Ohio. It is in excellent condition and part of a large set of Spiral Flutes that we have. This was made by The Duncan Miller Glass Co. in the 1930’s, and 1940’s. Very hard to find! 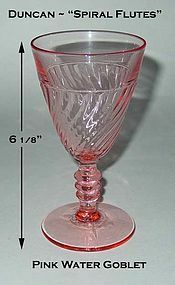 This pink Spiral Flutes tall stemmed water goblet is in excellent condition. These are fresh from an estate here in NW Ohio. 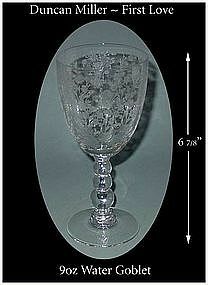 It is in excellent condition and part of a large set of pink or rose Spiral Flutes that we have. This was made by The Duncan Miller Glass Co. in the 1930’s, and 1940’s. Very hard to find! 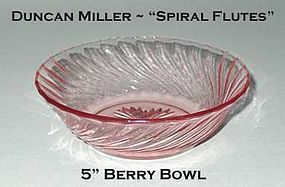 This pink/rose Spiral Flutes 5 inch berry bowl is in excellent condition. These are fresh from an estate here in NW Ohio, and are in excellent condition and part of a large set of Spiral Flutes that we have listed. This was made by The Duncan Miller Glass Co. in the 1930’s, and 1940’s. Very hard to find! 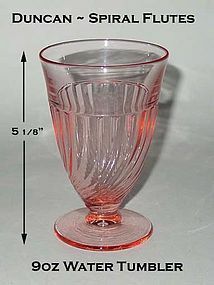 This pink or rose Spiral Flutes 9 oz footed water glass is in excellent condition. These are fresh from an estate here in NW Ohio. It is in excellent condition and part of a large set of Spiral Flutes that we have. This was made by The Duncan Miller Glass Co. in the 1930’s, and 1940’s. Very hard to find! 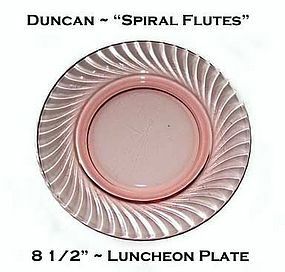 This pink or rose Spiral Flutes 8 1/2” luncheon plates are in excellent condition. These are fresh from an estate here in NW Ohio and part of a large set of Spiral Flutes that we have. This was made by The Duncan Miller Glass Co. in the 1930’s, and 1940’s. Very hard to find! 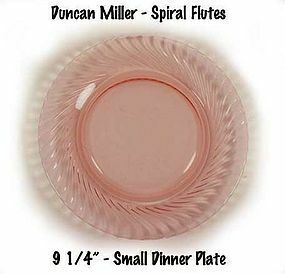 This pink or rose Spiral Flutes 9 1/4” small dinner plates are not chipped but do have use marks on them. We priced them reasonable because of the scratches. These are fresh from an estate here in NW Ohio and part of a large set of Spiral Flutes that we have listed. This was made by The Duncan Miller Glass Co. in the 1930’s, and 1940’s. Very usable, and hard to find! 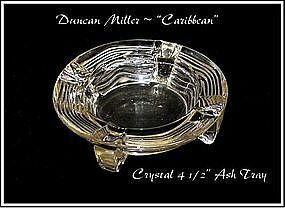 This 1930's crystal Caribbean ash tray was made by the Duncan Miller Glass Co. and is in gret condition! 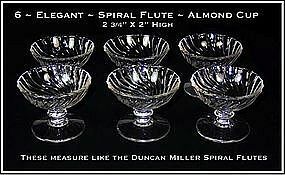 These footed almond dishes were made by Duncan Miller in the "Spiral Flutes" pattern. They are in excellent condition and sport a 3 way mold. 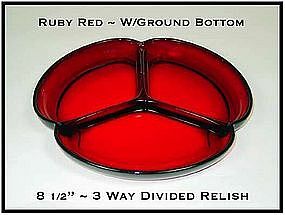 This 1930's elegant royal ruby relish is in excellent condition!. It looks and feels like Duncan Miller quality and is dark in color. The bottom is ground and there is no damage. You hardly ever see a royal ruby relish! It would go with most red dinnerware. Very elegant! 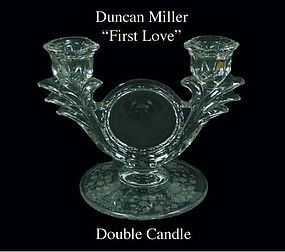 Duncan Miller "First Love" 9 oz water goblet in excellent condition. 4 available.